Donald Trump was an outsider who boldly stormed the citadel of Washington DC and won. He has promised real change, but his infrastructure plan appears to be just more of the same -- privatizing public assets and delivering unearned profits to investors at the expense of the people. He needs to try something new; and for this he could look to Abraham Lincoln, whose bold solution was very similar to one now being considered in Europe: just print the money. It sounds great; but as usual, the devil is in the details. Both parties in Congress agree that infrastructure is desperately needed. The roadblock is in where to find the money. Raising taxes and going further into debt are both evidently off the table. The Trump solution is touted as avoiding those options, but according to his economic advisors, it does this by privatizing public goods, imposing high user fees on the citizenry for assets that should have been public utilities. Raise taxes, add to the federal debt, privatize -- there is nothing new here. The president-elect needs another alternative; and there is one, something he is evidently open to. In May 2016, when challenged over the risk of default from the mounting federal debt, he said, "You never have to default, because you print the money." The Federal Reserve has already created trillions of dollars for the 1% by just printing the money. The new president could create another trillion for the majority of the 99% who elected him. Under Trump's plan " the federal government would offer tax credits to private investors interested in funding large infrastructure projects, who would put down some of their own money up front, then borrow the rest on the private bond markets. They would eventually earn their profits on the back end from usage fees, such as highway and bridge tolls (if they built a highway or bridge) or higher water rates (if they fixed up some water mains). So instead of paying for their new roads at tax time, Americans would pay for them during their daily commute. And of course, all these private developers would earn a nice return at the end of the day. The federal government already offers credit programs designed to help states and cities team up with private-sector investors to finance new infrastructure. Trump's plan is unusual because, as written, it seems to be targeted at fully private projects, which are less common. It's the common justification for privatization, and it's been a disaster virtually everywhere it's been tried. First of all, this specifically ties infrastructure--designed for the common good--to a grab for profits. Private operators will only undertake projects if they promise a revenue stream. . . . So the only way to entice private-sector actors into rebuilding Flint, Michigan's water system, for example, is to give them a cut of the profits in perpetuity. That's what Chicago did when it sold off 36,000 parking meters to a Wall Street-led investor group. Users now pay exorbitant fees to park in Chicago, and city government is helpless to alter the rates. You also end up with contractors skimping on costs to maximize profits. 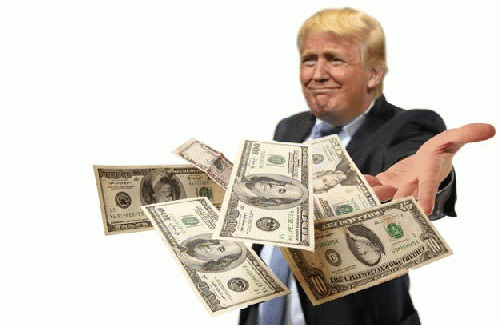 That is the plan as set forth by Trump's economic policy advisors; but he has also talked about the very low interest rates at which the government could borrow to fund infrastructure today, so perhaps he is open to other options. Since financing is estimated to be 50% of the cost of infrastructure, funding infrastructure through a publicly-owned bank could cut costs nearly in half, as shown here.